Are you interested in learning more about Jewish Renewal—and understanding your own relationship to Judaism as a spiritual practice? Join us for our next installment of From Reb Zalman's Bookcase, a book club series that will take us on an exploration of Jewish Renewal, Reb Zalman Shachter-Shalomi's legacy and the inspiration for Asiyah. 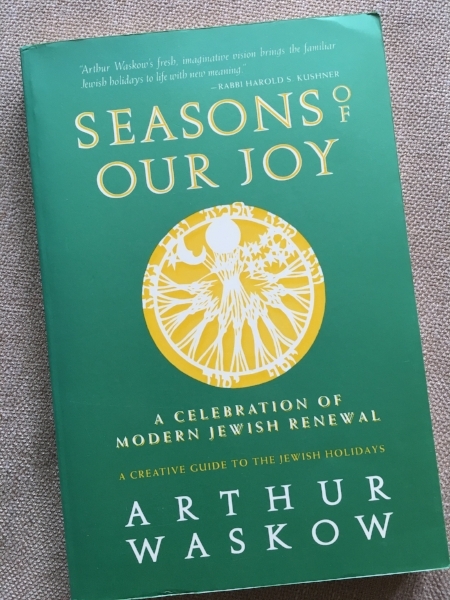 For April, we’re returning to Seasons of Our Joy: A Creative Guide to the Jewish Holidays, by Rabbi Arthur Waskow. Pick up a copy now and get ready to join us for a rich discussion a week before Passover! Plan on reading the chapters on Passover and the Omer (9 & 10), the introductions (if you haven’t already), plus whatever else captures your fancy. If you’re reading the book and plan to come to the discussion, please let us know. There are several copies of the book in the Minuteman network of local libraries, as well as many used copies available on alibris for low prices. Check out our FAQ page. For more information, send us an email.